Initially use only 1 and 2 word expressions: “I see.” “Look.” “You go.” Build vocabulary and comprehension slowly. Categories of words — nouns, verbs, adjectives, prepositions, questions — are grouped by color codes, reflecting the organization of language. Expect your child has something to say. Look and listen for some form of communication: Gestures, eye gaze, pointing, attempts at speech and words. Give the child at least 10 seconds to respond after you have said something or asked a question. Use words within an activity (action) whenever possible. “You said, ‘Come Mommy.’ Here I come.” Position yourself in the front of the child so that your expressions enhance the communication. Respond to all communication, even if it seems unintentional. If your child unwittingly points to the symbol for “thirsty”, respond with, “You said ‘thirsty,’ let’s drink some water,” while pressing the symbols for “thirsty” and “drink.” This will build a sense of competence and self-esteem. Give positive feedback; repeat sounds and words expressed by the child. Take turns speaking. Communicate a sincere desire for information. Asking questions the child thinks you already know the answer to — such as “What’s my name? ” — may result in no response or turning away. Use a different expression and tone for self-talk: “I am walking.” Be direct, use eye-contact when speaking to the child: “you are playing.” Talk about activities as they occur naturally. Don’t say, “You touched the picture.” Do say, “You said ‘eat. '” Reinforce the communication by pressing the “eat” symbol and follow up by offering something to eat. 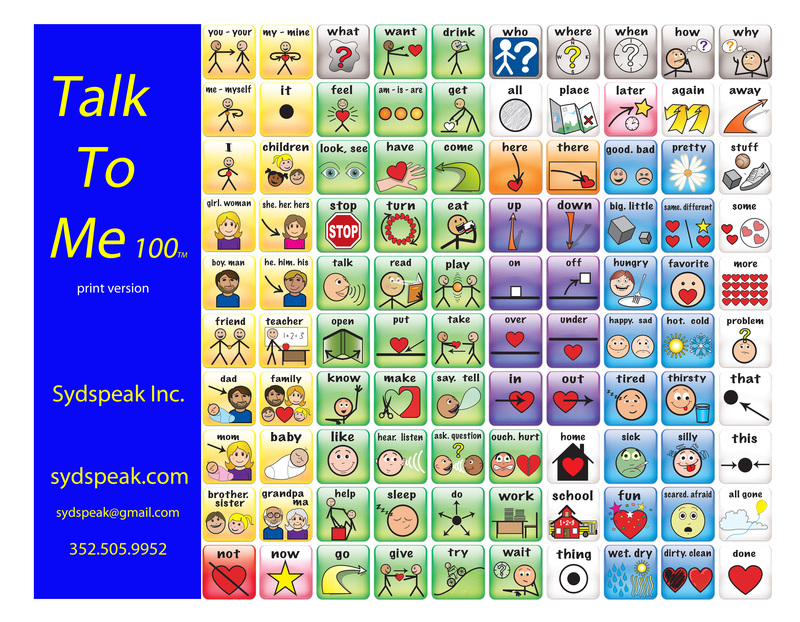 Use 100 word communication board daily and listen to what your child has to say. Using the 100 words is not a game, but it should seem like one. Enjoy yourself. Enjoy the magic of seeing — and hearing — a child learn to talk.